This week I thought that I’d write about writing at Puget Sound. There are a number of reasons this unequivocally meta blog topic comes to mind. For one thing, Friday was the official, Congressionally-endorsed “National Day on Writing,” which we celebrated at the Center for Writing, Learning, and Teaching with free pencils and the creation of a collage featuring people’s statements of #WhatIWrite (the official twitter hashtag of the National Day on Writing). And there’s another reason I wanted to write about writing: the most viewed and emailed article this week from the Chronicle of Higher Education was about how writing should be taught in every discipline, and should specifically be used prominently in exams to better assess student thinking. Seeing that the stars have aligned around the importance of writing this past week, I wanted to take this opportunity to share some of the many ways to get involved in writing at Puget Sound. I’ll also discuss some of the ways that I have been writing recently. Writing is a fundamental part of the Puget Sound academic and extracurricular culture. From writing-intensive freshman seminars to thesis-producing senior seminars, writing is involved in the entire panoply of Puget Sound coursework. This isn’t an exaggeration – even my science classes involve writing – lab reports, essays, and homework questions involving written explanation of quantitative work are all ways that my science classes have incorporated writing into the curriculum. So Puget Sound is already ahead when it comes to the Chronicle’s suggestion for using writing to evaluate thinking, even in the sciences. Meanwhile, my discussion-based classes function as preparation for writing in addition to allowing for collaborative learning. Discussion provides a way to try out paper ideas without the formality of having to put them into writing and, in doing so, some larger organizational structure or argument. I’m not sure what my papers would look like without having the opportunity to try out ideas in discussion and to hear what people find important or problematic about a text. Of course, plenty of good writing can be done outside of formal classroom discussion, but I find that having a chance to hear what others have to say about a text allows me to practice joining in scholarly conversation, to get a sense for what other critics have thought (and what my classmates think), and for how evidence is usually interpreted. And joining in a scholarly conversation is really what academic writing is all about. Outside of class, working at the Writing Center has taught me a lot about writing (often on a level that I would never have thought about before). Working with other writers has taught me to think about how I approach my own writing, and it has shown me how other people approach their own writing. I think that I have learned as much from my writing advisees as they have from me. I enjoy providing an extra eye for other students’ writing at the Center immensely. The best part of working at the Center seeing students leave excited about ideas they’re arrived at during an appointment. In addition to working with students on their own writing, I also write article reviews of Writing Center and composition theory criticism for the Center staff. This gives me an opportunity to engage with Writing Center criticism while developing my own ideas in writing. It’s a great opportunity to become familiar with the existing body of Writing Center research and for developing my own research interests, all while helping other writing advisors do the same. That’s enough on the writing that I do (although, I could go on – there is never a shortage of blogs, essays, articles, reports, plays, applications, and so on to write at UPS). Now I’ll discuss some opportunities to get involved in writing on an extracurricular level at Puget Sound. Puget Sound’s student publications are a great place to showcase one’s writing. The student newspaper, The Trail, the literary magazine, Crosscurrents, Wetlands, a journal concerning gender and sexuality, and Elements, Puget Sound’s science magazine are all places for students to publish their writing. Students interested in playwriting and drama can submit their work to Student Initiative Theatre’s various play festivals, which feature entirely student-written theatre. There are two main festivals, one for ten-minute plays and one for 30-40 minute one-acts, as well as opportunities to produce independent projects for full-length student-written works. Lastly, student research is almost always presented in a written form, especially in the humanities. Summer research projects typically result in academic papers, and Puget Sound’s research grants support student research culminating in a written presentation. Most majors require a thesis, and all provide the opportunity to write one. In short, Puget Sound provides ample opportunity for writing, and is already implementing most of the things the Chronicle proposes for “overhauling” the education system through placing a greater emphasis on writing. This comes as no surprise: Puget Sound’s numerous opportunities for communicating in writing across disciplines provides students with constant opportunities to communicate in writing in a variety of contexts. Learning to write for different audiences and about different topics is imperative for communicating beyond college, and is certainly a focus of any liberal arts college, but I believe that Puget Sound is unique in its focus on written communication. 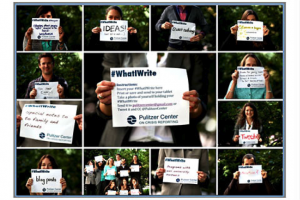 This entry was posted in 2012-13, Billy Rathje '15 and tagged #WhatIWrite, Billy Rathje, National Day on Writing, Puget Sound, research, science, UPS, writing, writing center. Bookmark the permalink.